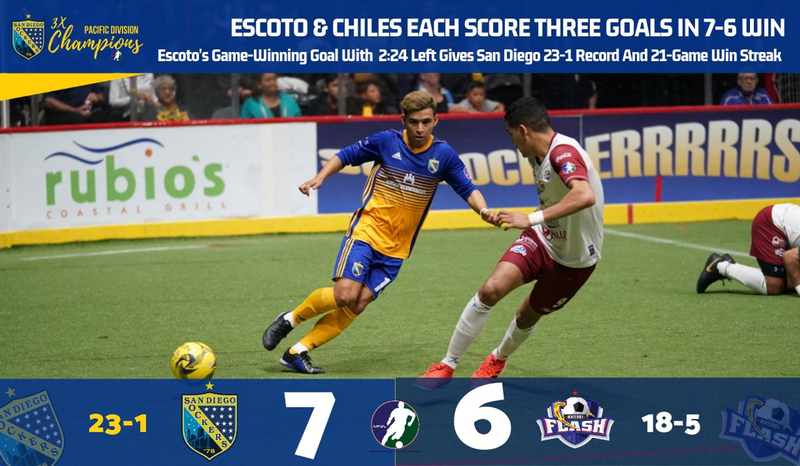 Brandon Escoto and Kraig Chiles each scored a hat trick, with Escoto’s short post rocket breaking a 6-6 tie with 2:24 remaining, as the San Diego Sockers escaped with a 7-6 victory over the Monterrey Flash on Saturday night at Pechanga Arena San Diego. 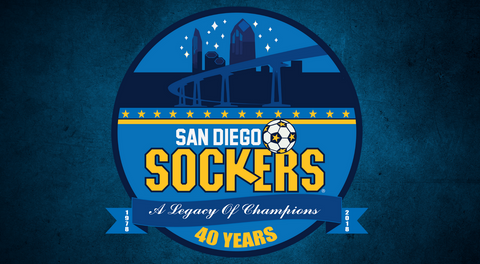 The Sockers (23-1) closed the regular season on a 21-match winning streak. Two of the top sides in the Major Arena Soccer League put on a show for a crowd of 7,399 on Saturday night with the dramatic finish the home fans wanted. After Miguel Vaca’s fourth goal of the match tied things at 6-6 for the Flash, the Sockers pressed the attack. Juan Gonzalez’s skipping cross settled perfectly for the one-time strike by Escoto, who unleashed an unstoppable bolt into the upper left corner of the net. Hiram “Pollo” Ruiz added a goal, and Landon Donovan contributed a pair of assists to the Sockers’ cause. San Diego surrendered leads of 4-1 and 6-4 before clawing back for the victory. Donovan’s first career blue card came just 41 seconds into the match, and led to Monterrey’s first of three power-play scores, as Edgar “Chapa” Flores found Vaca for a back post tap-in and a 1-0 lead at 2:04 of the opening quarter. Escoto answered quickly, running a give-and-go with Leonardo De Oliveira and cleaning up Leo’s blast off the goal wall for his 30th goal of the season at 2:57. The Sockers then erupted for three straight goals, with Chiles marking twice, and Donovan setting up Escoto’s second of the night just seconds after a power play elapsed. The 4-1 lead held until the final two minutes of the first half, when San Diego was called for a blue card on a late challenge by Escoto. Franck Tayou’s league-leading 47th goal of the year came on a feed from Vaca at 13:29 to narrow the lead. Seconds later, Sockers keeper Boris Pardo (21 saves, W, 22-1) fumbled a clearance on the right wall under pressure from Vaca, who chased him back to goal in pursuit of a bouncing ball, and tapped home the scrambler to create a 4-3 score line heading into halftime. An errant tackle by San Diego’s Travis Pittman led to a third blue card on San Diego before the half had ended, and the power play continued for Monterrey into the third quarter. Vaca’s finish in traffic from Edgar “Chapa” Flores forged a 4-4 tie just 31 seconds into the second half. San Diego regained the lead on a spectacular solo effort from Hiram “Pollo” Ruiz, who stole a ball in the offensive third, saw his shot blocked back to his feet, took another touch to his right and then ripped a curving strike into the left netting for his sixth goal of the year and a 5-4 advantage at 10:23 of the third quarter. Chiles’ hat trick goal, a power play score from Donovan at 5:01, reestablished a two-goal lead for the Sockers and seemed to ensure victory. However, Franck Tayou was able to steal a ball from Ray Contreras in the San Diego defensive zone when Pardo was out wide anticipating a cross pass. The three-time defending MASL MVP turned the steal into his second goal of the night, beating Pardo’s rush back to frame. Vaca’s fourth of the night at 9:36 leveled the score, before Escoto’s heroics sent the second-largest crowd in the MASL this season home happy. The Sockers await Sunday’s result between the Ontario Fury and the Flash, which will determine the final playoff berth in the Pacific Division. 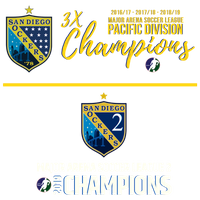 If the Fury prevail, San Diego will meet Ontario in the division final round; if Monterrey wins, the Tacoma Stars will earn the berth. Either way, the best-of-three divisional round will begin with a road match on Friday, and the return leg (and possible mini-game) at Pechanga Arena on Saturday night. 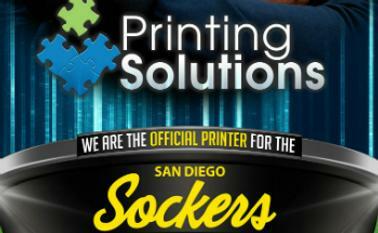 Tickets are available at (866) 799-GOAL or SDSockers.com/playoffs.